Private lessons are a wonderfully different way to learn. My business is called Come Paint With Me© because I paint along with my students. Imagine the possibilities when you are painting side by side next to your instructor. No note taking...we learn by doing. I place special importance on a personal style that may be emerging in your paintings. Yes, many beginners do have a style shining through even when they are just getting started. I help my painters to notice the abilities they already possess. Most students finish an original oil painting after only two sessions! We choose a subject together and we begin, painting side by side. You walk in the door and we get started. When you arrive at the studio I have readied a palette, paints and brushes for you. I have both long and short handled brushes for you to use. When our session is finished I do the cleanup. A session is two hours and it usually takes two sessions to complete an 11X14 painting with me. I only ask that you commit to coming twice so that you can go home with a finished painting. What happens after that is up to you. There is no contract. You may wish to continue privately or find a partner to paint with. When you paint with someone else you share the cost of the lesson with your partner. Painting with the instructor working at the easel right next to you is a wonderful way to learn! 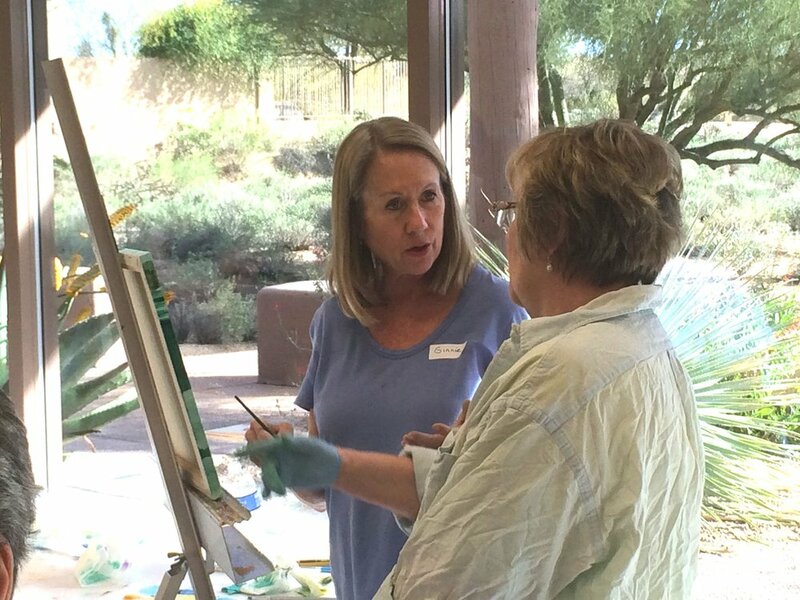 Beginner: In our two 2-hour sessions we cover choice of subject, blocking in a full color sketch and, during the second lesson, we complete the finished oil painting. I supply all the materials, including up to a 11X14 inch canvas. I highly recommend a 9X12 canvas if you are just getting started. Advanced: I often work with more advanced students who want to learn something very specific, like how to paint snow or the anatomy of a horse. I supply all of the materials you need and up to a 11X14 canvas. If you wish to use a larger canvas or a special size you may bring a canvas with you. Or I can supply that special canvas at my personal cost. Professional: Some of my students are looking for guidance as they transition to becoming professional artists. Breaking into the art business is a specialty of mine. My younger students have a willingness to explore and play. I give them the choice for subject matter, use of color, level of detail. When they aren’t told to paint within the lines the results are astounding. I suggest parents bring their children by the studio before our first lesson so we can get to know each other and they know what to expect when we paint together. Pricing is the same as adults. A one-hour lesson is $60. Gift Certificates are available. Parents are welcome to stay and watch the lessons, but we let the child make that decision. Yes, they do paint in oils, which is something they are very proud of. And they love to get their finished paintings framed. I have experience teaching children as young as seven years old. An hour of painting seems to be the perfect amount of time for my younger students. I set my teenage students up for success. We start with a theme like Spring Color, but each person chooses their own picture to work from. I create a supportive atmosphere where everyone can paint their personal interests. A variety of subject matters ensures that each painter can comfortably paint what works for them. All skill levels are welcome in my workshops, with 8-10 students in a larger studio facility. Everything is included and I supply up to a 11X14 canvas. Students are encouraged to bring photographs to paint, or select from the assortment I bring. Everyone gets individual help and we also learn as a group. We work together as a class and I provide teachable advice that benefits the entire class throughout the day. Design your own studio painting party. What better way to spend time with friends than to create together. Design a special morning or afternoon private event with friends. Up to five adults, in my studio. Contact me for pricing. You can bring whatever food and drinks you like.